Winter Golf is here! For some that means the clubs are locked away in a miserable hiatus within the garage until Spring, but at Golfshake we are aware that many of you dedicated and hardy golfers continue to play throughout the cold and dark months, so it’s a perfect time for us to launch our #GetCloser Challenge in Association with Cleveland Golf. This is all about the short game and improving your stats around the greens. Facing the often-inclement conditions and imperfect lies of November and December, this is the time of year when your scrambling skills are most extremely tested when playing. We want to see you make up-and-downs and sand-saves, but if you required an extra incentive to get involved, the winners of the campaign will receive either CBX or RTX3 Wedges from Cleveland. To assist with this endeavour, we have produced ten helpful tuition videos with European Senior Tour Professional Andrew Murray, joined by Chloe Allyn of On the Green with Chloe and Kevin Paver of Hackers to Single Figures, which should provide that extra bit of insight that will make a difference to your stats on the course this Winter. Track your Scrambling, Up-and-Down or Sand Save stats in the Golfshake ScoreTracker. 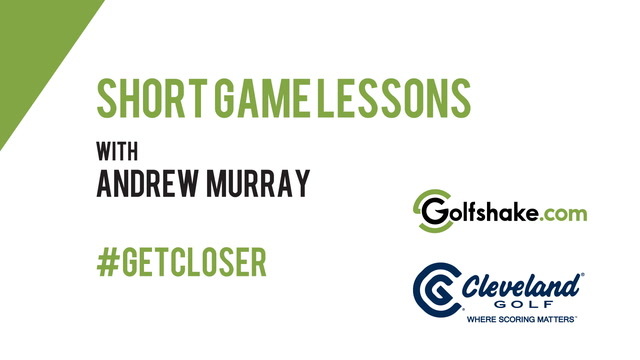 Sign up for the #GetCloser TIPS with Andrew Murray, Chloe Allyn and Kevin Paver. Winners shall receive either CBX or RTX3 Wedges from Cleveland Golf.